Before Christmas our caffeine-fueled team at work, a little disgruntled as the floor's coffee maker kept on breaking, decided to pitch in and buy our own Tassimo, the T20 (model pictured on the right). We are quite enjoying it! 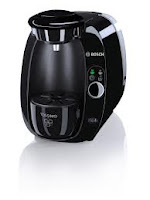 I then wanted one for home but my colleague at work, Bryan, who was looking for a new coffee system at home for himself too, explained his thinking. Why by the same system for home and drink the same coffee we drink during the week? Why not get a Keurig instead and drink different brands of coffee? I thought it was a good idea so I went out and bought myself the Keurig Elite. Now that I have been using both for over a month, it's time to compare. The Tassimo advertises its barcode technology, which is an excellent feature of the system. The barcode is on each coffee disk and tells the brewer how much water to use, the temperature to bring the water to and the length of time for the brew. It turns out a great coffee. I always have a supply of Tim Horton's coffee disks in my desk, among other brands, and people asks me how it compares to the store brewed coffee. It is quite close but just a touch weaker. Keurig does not have this feature and instead has buttons to choose a small, medium or large coffee. The more expensive machines also allow you to set the temperature of the water, a feature by manager, Lee enjoys, (he has a Keurig system at home too) as he likes his coffee extra hot but can turn down the temperature when making hot chocolate for the kids. To me, the Tassimo leads here as a brewing system. Bryan, Lee and I all agree that it is the coffee selection which puts Keurig ahead of the Tassimo. Green Mountain Coffee's K-cup patent expired in the fall allowing coffee companies to offer their own versions. This plus Green Mountain has been actively licensing as many coffee companies as they can. Tassimo does have a great selection of coffees and teas but the Keurig choices seems about endless. Currently I have eight different kinds of coffee at home for my Keurig and have tried a few more. The selection seems endless. My favorites so far are the Starbucks Blonde, Donut House and the President's Choice Medium Roast Gourmet. My favorite Tassimo brands are the Tim Horton's (I am a huge Timmy's fan), Second Cup Paradiso and the Great Canadian Coffee from President's Choice.